After a successful nearly sold out session we’re partnering with Dr. Bono and Bellville School District 201 to repeat the same workshop again! Dinner, Book and learning included! What makes people happy and how can we increase happiness in our lives? Our society sends us many messages about what should make us happy (which many people buy into—literally). What does the research suggest about the validity of these messages? It turns out there may be an even simpler path to living the good life. 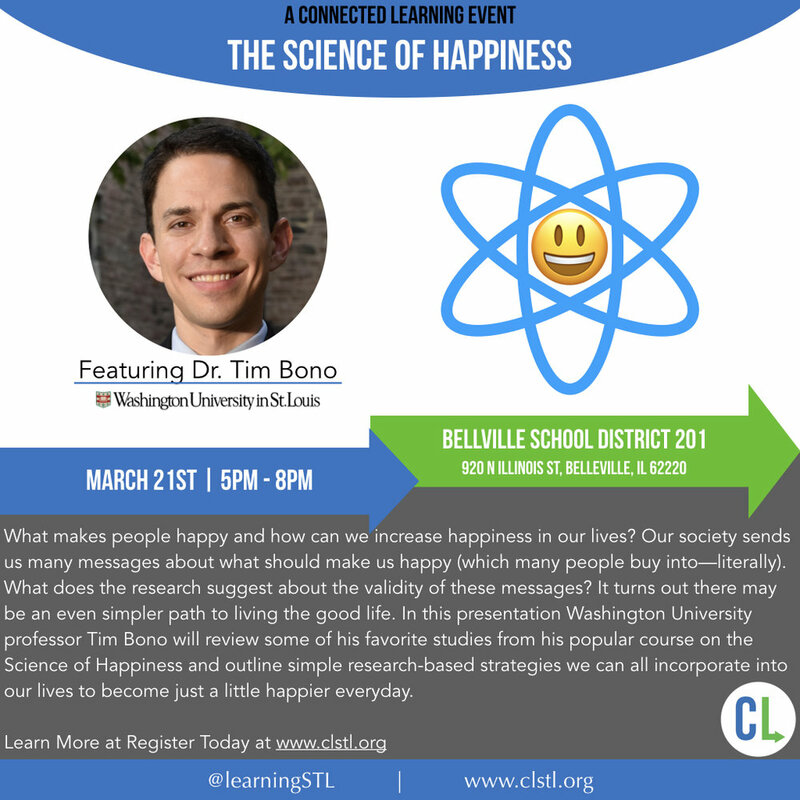 In this presentation Washington University professor Tim Bono will review some of his favorite studies from his popular course on the Science of Happiness and outline simple research-based strategies we can all incorporate into our lives to become just a little happier everyday. Dr. Tim Bono is a faculty member in the Department of Psychological & Brain Sciences at Washington University. His teaching and research focus on positive psychology and college student development, and his work has been featured in a number of national media outlets, including CNN, Fast Company, NBC News, and The Associated Press. At WashU he has won several teaching awards and thousands of students have taken his courses on the Psychology of Young Adulthood and the Science of Happiness. He summarizes the research from those courses, along with how his students have put that information into practice in their own lives, in his new book entitled When Likes Aren't Enough: A Crash Course in the Science of Happiness. 2) The importance of gratitude/keeping things in perspective when things go wrong (i.e., we still have to address adversity when it comes up, but not get so caught up in it that we stop giving attention to building on what's working, too). 5) Emotional intelligence and not jumping to conclusions about what others are thinking and feeling.